The Adoration Chapel was the first structure built in the Divine Mercy National Shrine. It is constructed for the purpose of immortalizing the Last Vision of Fatima. Almost five thousand (5,000) or more people attends and see the blessing of the Adoration Chapel. Then the Grotto of Our Lady of Fatima with water flowing down the landscape on which the statue of Our Lady of Fatima is standing was constructed. Bamboo benches were installed but later replaced by wooden phalanges for better strength and durability. It is also more comfortable to sit onto. The First Eucharist was celebrated at the site on the 2nd day of February, 1992. April of the same year, former Bishop of Malolos, Most Rev. Cirilo Almario, Jr. witness the Ground Breaking of the Church Site. The Parish of the Divine Mercy was formally established with Fr. Vic Robles as its first Parish Priest. 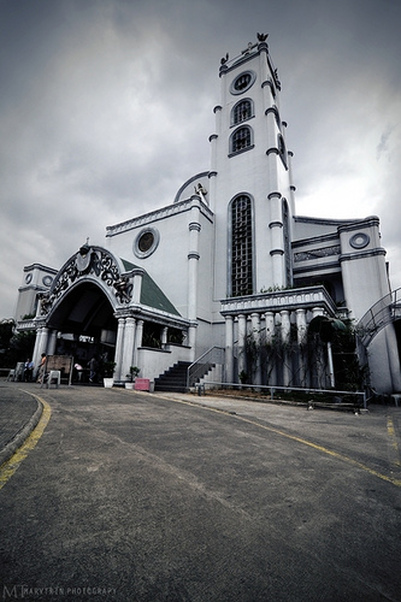 The Parish was declared as Diocesan Shrine by then Bishop of Malolos, Most Rev. Rolando Tria-Tirona together with the Council of Priests on the 4th day of April, 1999. And Three years later, it was given the status of a “National Shrine” by the Catholic Bishops Conference of the Philippines (CBCP) headed by its President Archbishop Orlando Quevedo, DD, OMI, on the 30th day of November, 2002. Fifteen years later, Fr. Mar DJ. Arenas takes over the administration of the Ministry as Fr. Vic Robles turned it over in the rite presided by then Papal Nuncio to the Philippines, Most Rev. Antonio Franco and Malolos Bishop, Most Rev. Jose Oliveros on the 26th day of June, 2005. He spearheaded the acquisition of additional parcels of land at the back of the Church making the National Shrine of the Divine Mercy one of the largest Church sites in the Philippines with a land area close to five (5) hectares. Rector: Father Reynaldo M. San Juan Jr.